Everyday is Earth Day for Farmers and Ranchers. Our lives depend on the land. We care for it so that it may care for us in an abundant and healthy harvest. We care for it because, for many, the land has been in the family for generations and to keep it for generations more requires care. All four kill deer eggs hatched thanks to a cautionary flag added to the road to keep vehicles from driving over the nest. This is the second of three owl boxes we have set up to help provide homes for Barn Owls. One box is fully occupied and we hope to have residents in the newest ones soon. We work with our farm consultants to utilize crop protection materials in a way that keeps these beneficial lady bugs thriving. We add wildflowers for bee and butterfly feed to promote healthy populations in both. None of these items is thanks to grant funding. We just strive to take care of our environment every day. The health of the land is vital to the health of our farm and family. Everyday is Earth Day for Farmers. It is no secret that I'm a big fan of all things home delivery. If I can try new clothes on without leaving the house, I'm in. I make very few clothing purchases in store these days and why would I do anything but mail order when it keeps getting easier! 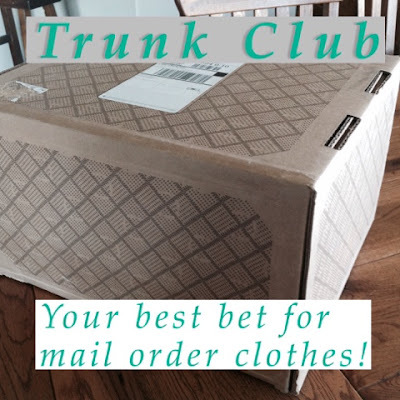 I have recently discovered Trunk Club which is a fantastic option now owned by Nordstrom's. 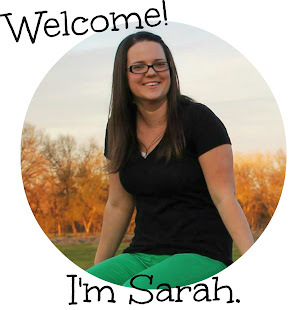 They originally started as a clothing company for men but expanded to ladies and then sold. So everything you get from them is also at Nordstrom's. I pretty much never shop at Nordstrom's because 1 - there isn't one for 100 miles and 2 - I think the layout is really confusing. But I am a lover of Nordstrom Rack. The way this service works is you complete a profile online (similar to the competitors). But it gets very different from there. A person then calls you. Yes, a real human. And she (or maybe he but mine was named Catherine) ask you about what you do and what you typically wear. She even had be go into my closet to talk about what brands I like and the sizing I wear in those brands. We talked for half an hour! In fact I actually gave my credit card info on the phone - it wasn't requested online. *Note that there is no styling fee and no shipping fee. There is no obligation to buy. But you will want to. Then she emailed me a link to their app. You will want the app because it makes the feedback and return shipping incredibly easy. Within a day she had compiled my virtual trunk. I could then go in and see the items and let her know if I wanted anything left out. I decided to trust her judgement and just try everything. The trunk arrived a few days later. When it arrives you have 10 days to decide and ship back what you don't want. 10 days made it so I need not worry about me traveling or hurrying to the post office. I also found myself trying things on more than once. So... what was in my trunk! In total they sent me 18 items in one big box. Some tops, dresses, bottoms and two pairs of shoes. 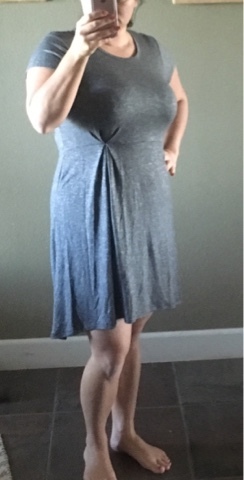 This is the dress I kept which perfectly matched my request for a simple jersey dress that I could wear all summer long. I love that it is a tiny bit longer in the back since it will be worn out and about with. 5 year old all summer long. This outfit really tempted me. I love the way the shoes look, but they aren't super practical for me and weren't all that comfortable. The dress was the most expensive item in my trunk - $150. But I really love that jean jacket. It turns out my old jean jacket looks pretty darn similar so after much debate, I shipped it back. I'm not sure these items were meant to go together (my fault not Catherine's). These linen pants grew on my and were an almost keep. They were very comfy and I actually liked the elastic ankles. But I couldn't kick the thought that there was some frump to them. The black top is a great staple item and was only $28 but I have three in my closet already. And the cardigan thing was really cool but it is already too warm in CA for transition items. This is the greatest maxi dress I have ever tried on. You can't see the shoulders well but the grecian style was awesome. And the most amazing thing was a built in slip (sorta thing) that ended mid thigh. Made the shape for my lower half way smoother. It did touch the ground so I'm seeing about getting a petite. $78 for this one. 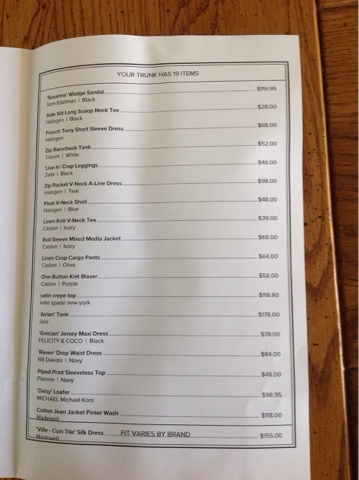 This is the list of all items and their original price. I appreciated that the prices changed in the app to reflect sales. One item was 60% off by the time it arrived. I am so impressed with this service! Things fit well and the stylist really listened to my requests. I requested too many items that I already have, so I need to work with her on that in the future. I've included a link for you to try it that gives me credit if you use it. It doesn't have a coupon code since they don't seem to offer any sign up incentives. Just great clothes! Let me know what you think and if you have tried it! After some good success on the first round using the ThredUp service, I decided to load up another bag to sell. 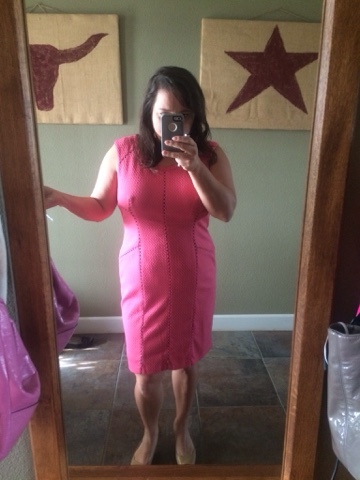 As a bit of review, ThredUp is an online consignment show where you can buy and sell gently used clothing. I think of it as an upscale online thrift store without the hassle of sorting through a real thrift store. The inventory changes daily which is a pro and a con, in my opinion. 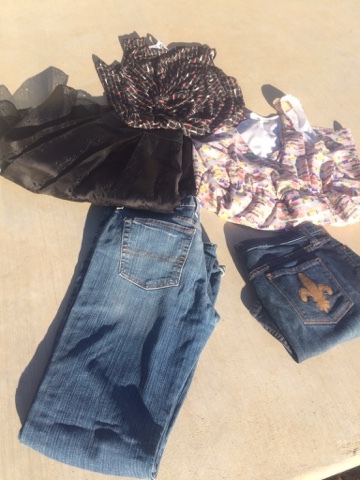 This time in my sale bag I included a few more items and several items that still had tags. The bag was 10 lbs this time! All things that I hadn't ever worn or hadn't worn in a long time. I've been getting more aggressive in clearing out my closet and this has been a big help! This round I got $18.78 for 8 items. Not enough to go on a shopping spree but better than nothing and for very little effort on my part. 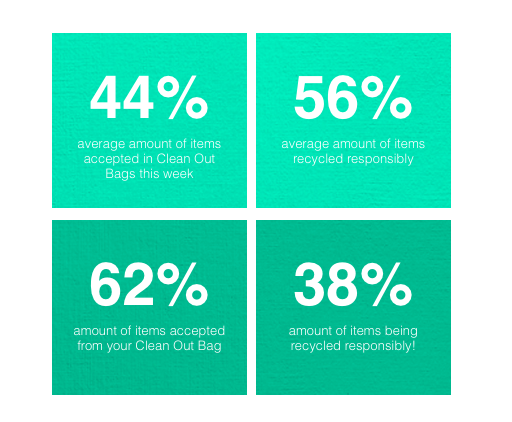 I didn't track what I sent very closely this time but ThredUp gave me these stats on how my bag compared to their average. I'm very happy with my experience. It is so easy to send a postage paid bag to them and see what happens. The donate any items that they don't buy to charity which helps you feel good about the whole process. My only complaint is that it takes almost 3 weeks for them to sort and value your bag. But considering the items were probably just collecting dust in your closet, not too bad. I still do donate to my local charity thrift store, but I have shifted what I donate. 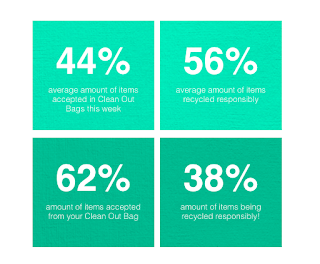 Name brand items are more likely to go to ThredUp that the local shop. I've got affiliate links included. It gets you $10 off your purchase and give me $10 off my next. Enjoy! I'm very lucky to have a friend who happens to run North America's favorite duck and goose hatchery. Metzer Farms is family owned and operated here in California. They have a huge selection of ducks and geese. I have a tendency to get my wonderful mom live animals for her Mother's day gifts so I decided this year to get her.... GEESE! Geese are ordered online - or by texting your friend Marc - and then arrive in the mail the next day thanks to our friends at the US Postal Service. So these little stud muffins arrived on Thursday. There were a hit from the moment I opened the box. They are packed with some hay bedding, a gel nutrition thing and a heating pad. They arrived healthy and active. 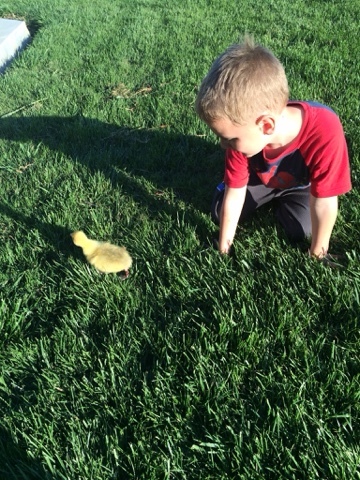 My kiddo enjoying one gosling on the grass. The kiddo found them pretty entertaining right away. The biggest surprise to me has been how incredibly friendly they are. You can set them down and pick them back up - not like most chicks. 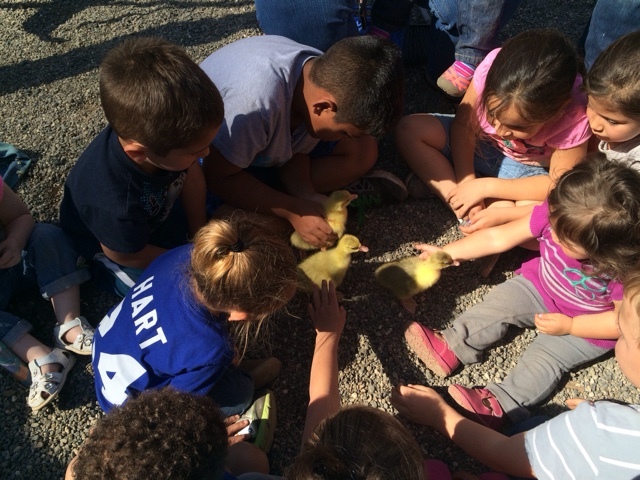 Since they were healthy and so darn friendly we took them on a field trip to preschool. The kids were, of course, thrilled to see geese. They all got to pet them and many held them. 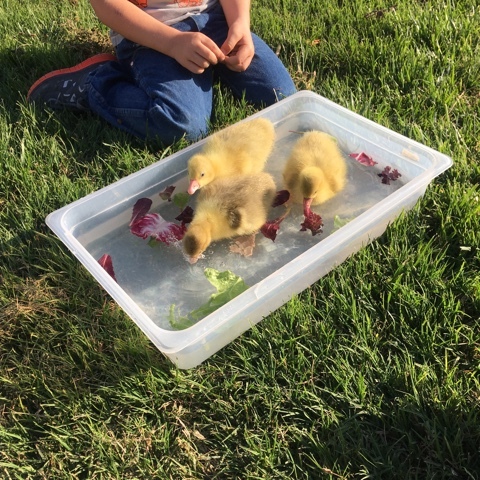 These are Sebastopol Geese which will grow up to be pure white and have beautiful curly feathers. I've always wanted one and now I kinda get one, just at my Mom's (the hubs is not a fan of Geese). 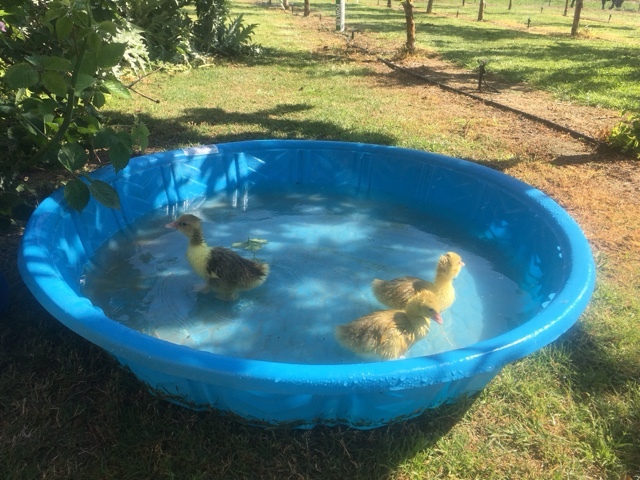 On Saturday we decided to let them experience the water. It was a big hit. Note that goslings shouldn't have too much time in the water until they are bigger and the start producing the oil that protects their feathers and keeps them warm (so says the internet anyway). So Sunday we got out the kiddie pool and let them do some more swimming. They don't swim for long but sure have a blast doing it. 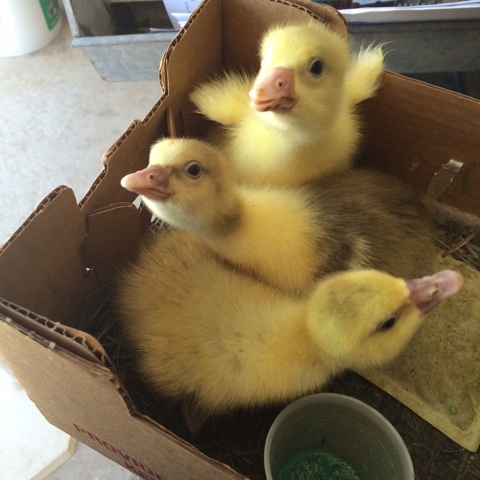 Geese are not wildly different than chicks to raise. They eat the same food for the most part but seem to need some added greens. They don't need to be as hot as chicks. But they do need a deeper waterer so that they can get their whole bill in the waterer. And that waterer gets crazy messy. Another cool benefit of geese (and ducks) is that (I'm guessing since they don't have to be as warm) you can order them in just pairs and have them shipped. So if you just want a pair of one particular breed, you can order them. These beauties will be heading to my Mom's house on Tuesday so we are enjoying a few more days of fun with them. Plane friendly food to save money on vacation with kiddos! The kiddo and I just returned from a wonderful trip! I had a conference to attend that was conveniently located just a block from Disneyland. This happened to be a VERY kid friendly conference so he got to join me. We then added a day to our trip and spent two days enjoying the magic of Disney. Anyone who is traveling on a budget knows that food can be a huge expense. Eating out can eat into your budget and may leave you with limited choices . And when traveling with a growing 4 year old, you need to have lots of snacks on hand. A hungry kid is usually a grumpy kid. We take much of our own food when we are on road trips (I need to do a post about traveling with my crockpot) but air travel can be a bit more challenging. When traveling by air, you have limited refrigeration options and are limited in the sizes of liquids and gels that you can carry. I generally do not check bags when flying but if flying with my kiddo I've found it to be a necessity. It is less to deal with in the security line and it allows me to pack some liquids/gels in the checked bags. I'm very pleased to have spent a whopping $15 on food in the parks over the two days (on foods I was really wanting to try) thanks to bringing food with us. We only spent another $11 in hotel food. That $26 in food over 4 days was due to some serious planning and hauling food with us. I should also note that the event we attended had lots of appetizer type foods which helped too. Here is a quick list of what we traveled with to give you some ideas. Uncrustables sandwiches (or homemade) - I pack just enough for day 1 and 2. They get dried out if they are defrosted much longer than a day. Lunchables packages (or homemade) - I like to take home made ones with salami for something the adults can enjoy. Just know that with lunchmeat you need to be sure it is kept cool. Tuna salad kits - just don't open this on the plane, please. Cheerios or other cereal boxes - I have a tough time finding the boxes in non-sugary options so we just take a container of Cheerios. Oatmeal packages - I always keep these in my carry on. You can use the hot water from the coffee maker to make this in your room. Fruit snacks - also found Disney themed ones. These should really be called sugar snacks, so don't think these are a substitute for fruit. Fresh fruit - pack this carefully. We have had luck with bananas and apples. Berries don't handle the transport well. You also may be limited with fresh fruit if you are traveling out of the state. Utensils! You do not want to forget these! We didn't need plates or bowls on this trip which saved some space. Green beans - now can be found in individuals cups! Corn is an option too. So what kind of meals did we make with this? We had oatmeal each morning with peanut butter added. We make it in the disposable hotel cups so the kiddo can eat it to go if needed. I'm not sure that we ever had a sit down lunch in the 4 days we were gone. We did uncrustables for day 1 and 2 and then just snacks the other days. Especially while in the park, I gave him snacks while we waited in lines and while waiting for shows/parades. We did enjoy an amazing corn dog in Disneyland and a meat stick too. We did not buy any food at all while in CA Adventure (mostly because it was raining). Not having a sit down lunch also frees up time in the park to go other things. For dinner we had macaroni and green beans one night, ravioli and green beans another and got a personal pizza at the hotel for the third night. Macaroni and raviolis do require a microwave. So they may not work for you if your hotel won't have one. Even if the hotel does not advertise a microwave, you can often request one. This isn't the most healthy food ever, but is probably close to as healthy (or better) as most fast food options you would find. I push the fruits and veggies first and the other snacks later. Have you ever had luck hauling food with you on a plane? I would love to hear what you took or your suggestions on what else I can take! I'm over a year into my Gwynnie Bee membership and can't part with it. I posted a couple months ago about this service and since the post have been better about taking pictures of my Gwynnie Bee dresses. So here is an updated post with my referral link - note that when you follow my referral link I get a $25 credit and you get a month free. I get a nice perk, but I figure you won't mind since you get a super good perk. 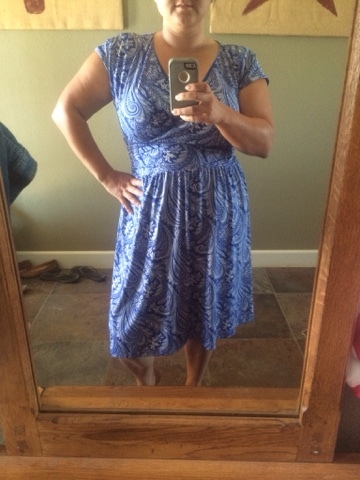 Gwynnie Bee is a clothing rental by mail service for sizes 10 and up. You create an online closet of styles and they ship you whatever happens to be in stock from your list. You can create priority items, but for the most part the items selected are pretty random from your closet. 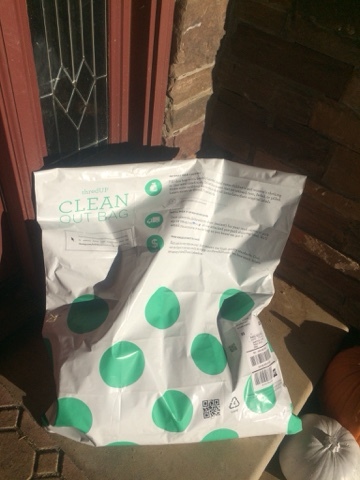 You wear the item once, or a dozen times and mail is back in the postage paid bags they send with the items. You don't even have to wash it - unless you want to wear it 12 times. :) As soon as they get the item, they send you another one. The subscriptions are monthly and sold in increments of items out at a time - 1, 2, 3, etc. You can change your plan at any time. I hardly needed professional clothes this summer so I was just 1 at a time, but this time of year I'm attending lots of professional events to I up it to 2 or 3 at a time. Pricing starts at around $35 per month for one item at a time. I can easily have 4 items in a month (if I return right away) so the per item cost is pretty good. You can also purchase the items. I have done that once but been tempted several times. The prices to purchase are a nice discount too since the items are used. For the most part the items are in great condition. 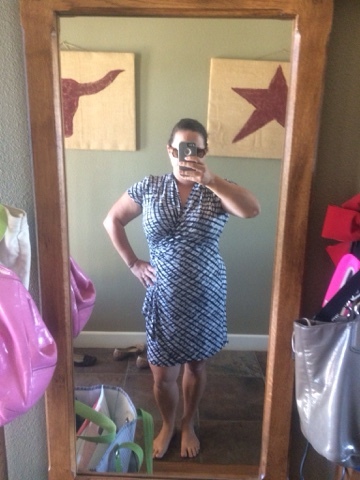 I did have an issue in October when the hem of a dress arrived already unraveling and looking bad. Their customer service could have been a bit better that time, but generally I've been very pleased with the service. 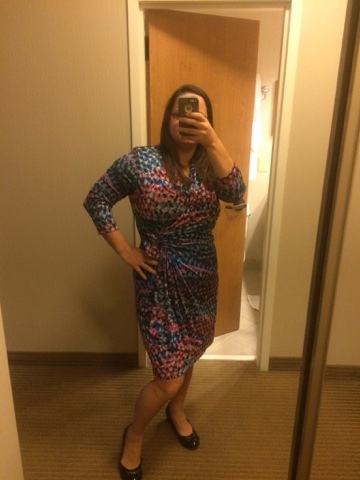 I wore this fun one at a conference I just attended. It also looked great with black boots. I wore this to an October wedding. I wore this for a morning teaching. I wore this to teach too. This got me hooked on tunics. 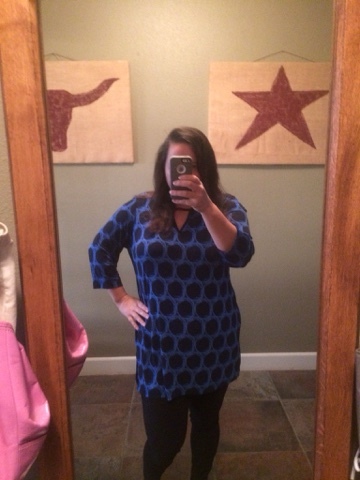 How had I never loved a tunic? So comfy! Ready to try it out? Follow my referral link - http://goo.gl/7X3F6f - to get one month FREE! I think you can even try a 2 or 3 item membership, which lets you try many items. Check it out and let me know what you think!